I have decided to do something a little bit different on my website. I am making up size-charts for each family on my checklist. Whether or not I am doing them up on my website. I thought it'd be interesting to put up size depictions of each animal. I've done several so far and I managed to scan them and put them up on the site, but so far nothing points to them yet. It's still a work in progress. With these, it'd be easier to display the varied sizes of each animal in each family. 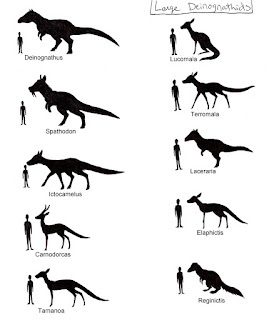 This is a size-chart of the large Deinognathids, and it shows the largest of each genus (in the case there is more than one species) up against an average-sized man. These are old, so I had to make a few changes to them. But anyway, you now get the idea of what will be coming up next on my Metazoic site. I thought these would be a good idea. And I will be doing one of these charts for every family. It's going to take a while, but it'll be done, hopefully by the end of next year. I have also begun working on a page for Metazoic reptiles and that should also be up soon. I got a few really good species I thought up to display. 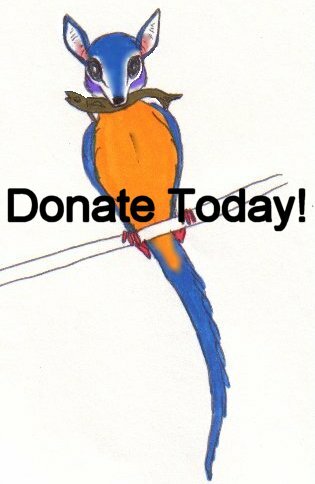 I'm not the World's best drawer of reptiles, so if anyone would like to help out in that department, please e-mail me at webmaster@metazoica.com I will do what I can by myself, but like I said, don't expect it to be great. Not unless I can get some more reptile experts to do my drawing for me!! That page should be up soon. Even after it is up, I will still be accepting any new drawings and stuff. I will try to get that page up this month. Gawd!Those predators are huge.Larger than a future predator I created called "Civenator" meaning Hunting Civet. I'd like to see your "Civenator". I always like seeing other peoples' ideas.